© 2019 Remy Clarkson. All rights reserved. Boost deal discovery and increase user engagement. 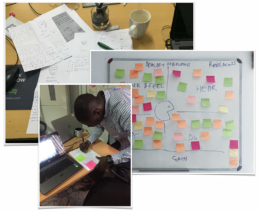 The first step I took was perform user research around DealDey’s customer-base. Including: stakeholder interview, online survey, reviewing analytics and user test. We defined how concepts feed into product and technical requirements. The product team then used these insights to create personas, write dozens of user stories, and eventually, outline the product requirements to cover the hypothesised, largest group of customers: individuals in their 20s and 40s and in the middle-upper income bracket. Product/Service Discovery: User can only see two deals per screen which means they have to scroll more to see less. Discount at a glance: Users prefer to see discount off for any deal on the listing page without having to view the details page. The existing app shows price slash and deal offer which is not compelling enough to prompt a buy. Indistinct Call to Action: The main CTA in the details page isn’t very distinct from every other element on the page. Poor Iconography: Visual elements across the app are outdated based on recent UI design trend; thereby making the general app user interface less appealing and desirable to use which is one of the attributes of any good mobile app. Information Architecture: Content layout look bit clumsy. repeated deal title on the same viewport. general layout needed some improvement to make content consumption easy. Improve the entire Customer shopping experience. Provide the relevant deals based on individual behavioural patterns. Improve In-App experience to match the website experience which had high conversion rates. 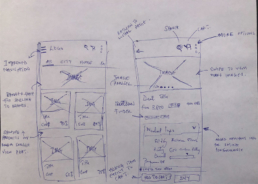 After reviewing the issues surrounding the product listing and detail pages, I mapped potential solutions to each of the pain-points and created rough UI sketches to encapsulate the solutions. 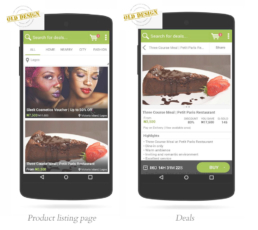 The unparalleled efforts for achieving an appealing user interface with well thought out layout, clear distinct CTAs, improved eye cues, information architecture (IA) and feedback by experienced designers, strategists, marketers and developers put into creating the app, naturally, bore fruit for DealDey. Nigeria’s online daily deals website offering unique and amazing deals on food, travel, hotels, spas, professional courses, restaurants, fashion items for both male and female, gadgets, mobile phones, electronics and much more at highly discounted prices. Have a project you'd like to discuss? Get in Touch.